Our Submersible Pumpsets & Monoblock pumpsets are approved in most of the Government Departments of various states, Industries, DGS&D etc. In order to have value engineering & innovation from time to time, the pumpsets are regularly inspected by reputed third party Inspecting agencies such as PDIL. RITES. DGS&D and many more. Which has resulted in adhering to introduce & establish stringent inspection norms. 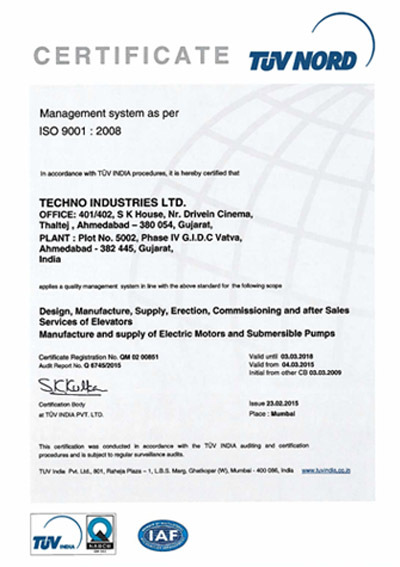 Our pumps have also been tested at ERDA and EQDC and have achieved all the parameters laid down therein. The organisation is professionally managed by various Directors / Marketing and Technical professionals & has received ISO 9001 - 2008 revision accreditation by ISOQAR LTD. which helped us further to streamline & produce products to meet the market requirements & to deliver them in specified timeframe. Our 700+ odd models have ISI mark confirming to IS 8034, IS 9079, IS 14220 & IS 7538, which symbolizes our vision to quality.